The Conquest Junior Leadership Program is a weekly virtue based program ran by dads and youth leaders. The Jr Program has its own unique Conquest materials for this age group. This includes Curriculum, t-shirts, bags, & commitment cards specifically designed for the younger age group. The 8-10 age range is a pivotal time in a boy’s life. Waiting on the threshold of his young life are the adolescent years which are highlighted by a sense of independence amid physiological, intellectual, emotional, social, and other types of changes. Therefore, it is imperative to assist him in learning and applying the basic truths of a virtuous, masculine life now. These truths will help him build a solid foundation that cannot be uprooted by the pressure of the world later. Of greatest importance in this quest for a virtuous foundation in the boys life is a personal relationship with Jesus, as his best friend. By means of mentoring, the boys are guided through the age-appropriate development of virtues such as respect, self-discipline, and obedience all while developing their faith and leadership skills. The Conquest Jr curriculum helps the boys learn about virtue, leadership and about their Catholic faith in a fun way. Each year the curriculum changes and we focus on five new virtues and saints, making up the Series 1, Series 2 and Series 3 curriculum. Each virtue campaign also includes virtue stickers that the boys can add to their commitment cards. There are coloring pages that you can print and send home. The programs have point tracker booklets and point chips as well. 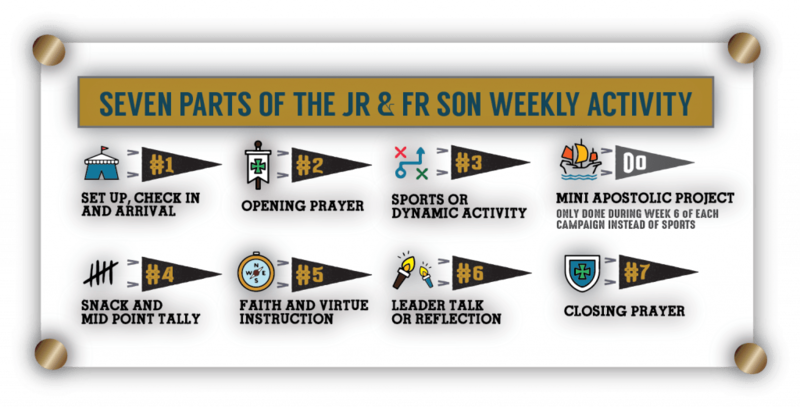 The 2018-19 Series 2 Junior Leadership Program focuses on five important virtues and five corresponding saints to teach the boys virtue and leadership. Each virtue campaign is six weeks long. The virtues are OBEDIENCE, KINDNESS, GENEROSITY, SELF-CONTROL, and COMPASSION. 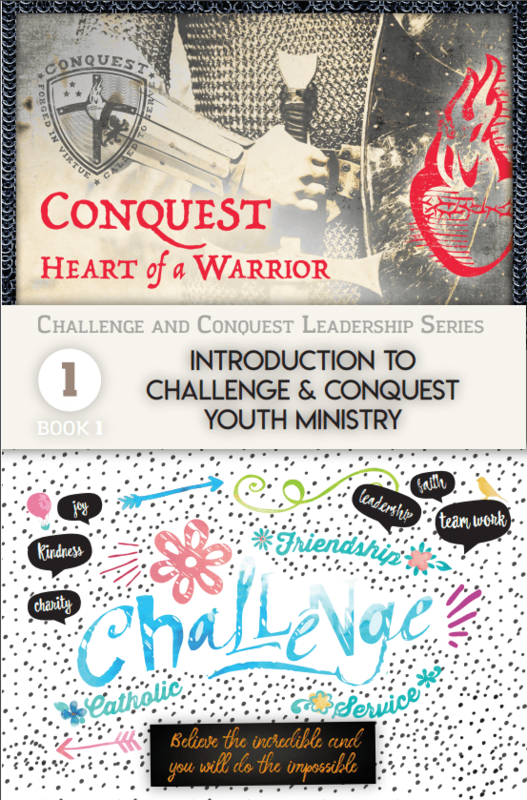 The Conquest Junior Adult Leader Kit for 2018-19 contains all the elements that the adult leader needs to run Conquest Jr. effectively. The most important item in this kit is the 200 page Conquest Jr Leader Curriculum Guide with the weekly activities. 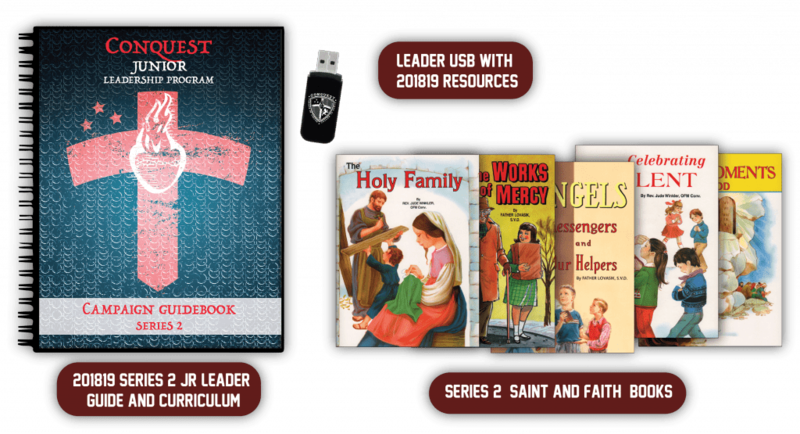 The Leader kit also includes Conquest Jr USB with hundreds of resources, Five Series 2 Saint and Faith Books, 5 Pack of Point Tracker Booklets, 20 Pack of the New Conquest Jr Brochures, 30 Pack of the Conquest Jr Commitment Cards, New 100 Pack Virtue Stickers with 20 stickers of each of the 5 virtues, Conquest Calendar and Prayer Book, Conquest Dog Tag and Pen, Conquest Red Duffle Bag and New Conquest Cotton Embroidered Baseball Cap. The Conquest Adult Leader T shirts are sold separately and available in Adult sizes. The Conquest Junior Member Kit for 2018-19 has everything a Conquest Jr member needs to participate in the program. It includes the Conquest Junior Navy Blue Drawstring Backpack, the 201819 Conquest Saint and Virtue Calendar, Conquest Prayer Book, Conquest Heart of a Warrior Dog Tag , Conquest Pen, and new Conquest Cotton Embroidered Baseball Cap. The Conquest Jr T shirts are sold separately and available in Youth and Adult sizes. If you have a Conquest Club Annual Membership for 2018-19, its very simple. Just go online to the Conquest online store and purchase the Conquest Jr material. If you do not have a Conquest club and are just starting, you will need to visit the Mission Network website to purchase your annual membership and you will receive an email with access to the online store, coupons for free Conquest Jr items and instructions. Visit our Conquest Junior Online Store or Conquest Registration Site to get started.